Does a youth misspent lounging and lazing condemn middle-aged folks to a future of bad heart health? Maybe not, a new, small study has found. 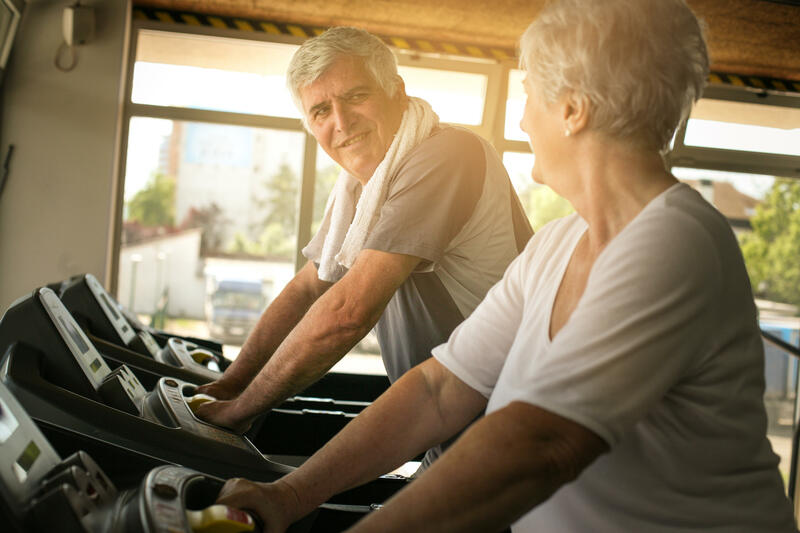 People in their 50s and early 60s can regain the heart health of someone decades younger through a regular and reasonable aerobic exercise program, no matter how long they've been inactive, the study authors said. Middle-aged couch potatoes who worked out four or five days a week -- including a couple of days of high-intensity aerobics -- for two years experienced a notable decrease in the stiffness of their heart muscle, the researchers found. A more flexible heart means less risk of heart failure as one ages, explained lead researcher Dr. Benjamin Levine, founder and director of the Institute for Exercise and Environmental Medicine at Texas Health Presbyterian Hospital in Dallas. "I was astounded at how well this seemed to improve the flexibility and compliance of the heart," Levine said. "The key to a healthier heart in middle age is the right dose of exercise at the right time in life." What wasn't known is how late in life a person can act to reduce that risk, and how much effort this would require. Earlier experiments showed that by the time men and women hit the 70s, intense exercise will do nothing to improve their heart health, Levine said. These studies also found that someone who only works out a couple times a week gains little when it comes to their heart. "We found casual exercise, two or three days a week, was simply not enough to preserve the youthfulness of the structure of the heart," Levine said. "That doesn't mean it had no benefits, but it wasn't enough to preserve that youthful rubber-band-like compliance." To see if a higher dose of exercise at a younger age would help, Levine and his colleagues recruited 61 people between the ages of 45 and 64 who were healthy but stuck in a low-energy sedentary lifestyle. Two days of high-intensity intervals: Exercises where a person works out as much as possible for four minutes, and then spends three minutes in active recovery before hitting it again, four times in a row. One day of long moderate-intensity exercise: At least an hour spent in some activity that raises the heart rate, be it square dancing, tennis, cycling or a brisk walk. "People generally like interval sessions because they don't last as long," Levine said. "You can work out hard and then recover, and it feels really good." After a while, all in the aerobics group transitioned to what Levine calls their weekly "maintenance dose" -- one high-intensity interval session, one long session, a couple of regular base-training sessions and a recovery day, along with some strength training. "We've got the dose, four to five days a week. We've got the 'sweet spot' in age -- late middle age," Levine said. "We apparently now can reverse the effects of sedentary aging." This program is specifically designed to be agreeable for middle-aged people who don't have the time or inclination to adhere to the same sort of workout program as elite athletes, Levine said. "It's my prescription for life," Levine said. "Exercise training needs to be part of your personal hygiene, like brushing your teeth or taking a shower or changing your clothes. You need to work it into your daily life." Heart health expert Dr. Nieca Goldberg agreed that the program tested in this study is "a reasonable goal for most people." "They can't think they're going to achieve this right out of the chair, but it is definitely doable," said Goldberg, medical director of the Women's Heart Program at NYU Langone Medical Center in New York City. Combining this program with a healthy diet, she said, "can only help as part of an overall heart disease prevention program."